For the seventh time, Turkey's President Recep Tayyip Erdogan has aired footage of the deadly attack on two Christchurch mosques at election campaign events, sparking anger and disbelief among New Zealanders according to FT. The partially blurred video of accused gunman Brenton Tarrant entering a mosque and shooting Muslim worshippers was played at the rallies, while a caption read "A terrorist who is the enemy of Islam and the Turks." New Zealand foreign minister Winston Peters condemned the move - saying that it misrepresented his country and endangered Kiwis abroad. On Monday Peters warned Turkish Vice President Fuat Oktay and foreign minister Mevlut Cavusoglu over Erdogan's decision to show the footage. The Turkish politicians had arrived in Christchurch on Sunday to express their condolences. "We made it very clear that we oppose terrorism in whatever shape and form it might be and that we are for a free and open society," said Peters, who added "We had a long dialogue on the need for any other country, or Turkey for that matter, to ensure that our country, New Zealand, was not misrepresented," according to the New Zealand Herald. Peters stressed the fact that the suspected gunman, Brenton Tarrant, was a citizen of Australia. Turkey’s Islamist president Recep Erdoğan is showing footage of the Christchurch massacre at political rallies. This tyrant is callously exploiting tragedy in an attempt to rebrand his awful image. An utter disgrace. On Monday, Erdogan invoked the 1915-16 victory of Ottoman soldiers against the Brisish at Gallipoli - connecting it to the New Zealand attack during monday commemorations. "One century on, they are still testing Turkey’s patience and determination," he said. "They are testing us with the messages they are giving from 16,500km away in New Zealand. This isn’t an individual act, this is organised." Tarrant, 28, threatened Turkish people in a 74-page "manifesto" he published prior to Friday's attack on two mosques, which left 50 dead and at least 50 injured. The manifesto says that Turks should be allowed to live to the east of the Bosphorus Strait that marks the boundary between the continents of Europe and Asia - running through Istanbul. He threatened to kill Turks living "in European lands." 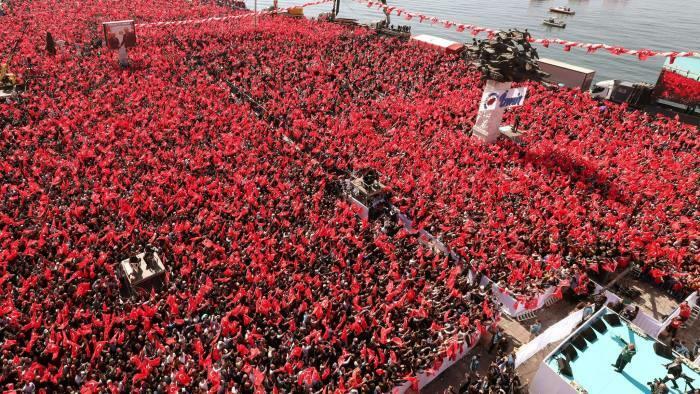 Citing these and other passages of the manifesto at the electoral rallies - which were broadcast on live television, Erdogan said that Tarrant's "real target" was Turkish people, the Turkish flag and the Turkish state. Mr Erdogan’s party is locked in a series of tight electoral battles to retain control of the nation’s most important cities amid a painful economic downturn. Most pollsters predict a loss of support for his ruling Justice and Development party given the sky-high inflation and rising unemployment that has followed last year’s currency crisis. "The only way he can contain the loss of votes that is a result of economic voting behaviour is through political tribalism, or identity politics," said Unluhisarcikli. "Muslims being killed in a mosque by a white supremacist is definitely an incident that can be used to trigger [these] values."